For the second time in five years Organizing Expert Chris McKenry was recognized by the West Hollywood Chamber of Commerce when he recieved the Ambassador of the Year Award. The new London of West Hollywood was the setting for the Creative Business Awards on November 5, 2008. “You can’t become an Ambassador without rubbing shoulders with the right people. No stranger to celebrities, at the age of 9 our honoree actually dined with the real Colonel Sanders,” joked Chamber Vice President Joan Henehan when presenting the award. A member since 2001, Chris served on the chamber’s board of directors from 2003-2007. During that time he lead the Design Committee for the chamber’s new office space. 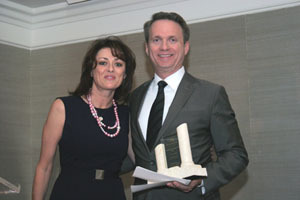 Chris also received the President’s Award at the Chamber’s Small Business Awards in June of 2003. This entry was posted in Awards and tagged Ambassador, Awards, Chamber, Chris McKenry, Colonel Sanders, Get It Together LA!, KFC, West Hollywood, West Hollywood Chamber of Commerce on October 6, 2011 by Chris McKenry.